The Junkers Ju 87 or Stuka (from Sturzkampfflugzeug, "dive bomber") was a two-man (pilot and rear gunner) German ground-attack aircraft. 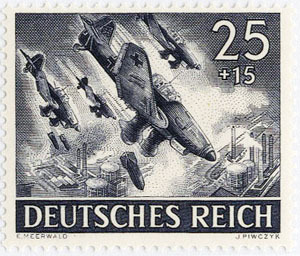 Designed by Hermann Pohlmann, the Stuka first flew in 1935 and made its combat debut in 1936 as part of the Luftwaffe's Condor Legion during the Spanish Civil War. 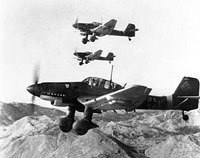 The Stuka operated with further success after the Battle of Britain, and its potency as a precision ground-attack aircraft became valuable to German forces in the Balkans Campaign, the African and Mediterranean Theaters and the early stages of the Eastern Front campaigns where Allied fighter resistance was disorganised and in short supply. 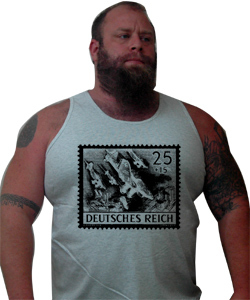 This design is in black ink and white ink on t-shirts, baseball shirts, tank tops, long sleeved shirts and hoodies exclusively at Tightrope Records.